Highlights of the expedition were visiting in Namche Bazaar for the second time Gheylsan Sherpathe, sole surviving high altitude Sherpa porter from the 1953 Hillary-Tenzing Everest summit, having tea with Lama Tenzing at Tengboche Monastery, and climbing Pokalde Peak with Ganesh. Rock climbing at 19,000 ft. with just you and your climbing guide is a real high. We anticipated arriving in the midst of a country in civil war, if our flights would get us into Nepal. Instead, our group of 5 middle-aged men arrived in Katmandu on Apr 28, two days after King Gyanendra gave up absolute power and recalled the Nepalese parliament. In the preceding weeks hundreds of thousands of demonstrators had daily taken over the streets to protest the King's abuse of power. The King had ordered the military to shoot demonstrators, and 17 pro-democracy demonstrators were killed by soldiers. The massive street demonstrations were the culmination of a growing hostility of the people toward the King's antidemocratic practices and his inability to quell the Maoist insurrection, which had spread from certain rural provinces to most of the country. By the time we arrived in Ktm the demonstrations had ended, the Maoists had declared a 90-day truce, and the major democratic parties had agreed to reconvene Parliament. We found a people delighted with the prospect of lasting peace and excited about the restoration of democracy. Our conversations with Nepalese revealed a deep distrust of the King and hope that the Maoists will be integrated into the political process. We learned that tourism was down by 75%, and there had been cancellations of 50% of booked expeditions. (Two members of our original group of 7 had cancelled out of security concerns just before the declaration of peace.) There were fewer Westerners in Ktm than I'd seen in my 6 expeditions to Nepal, and other than a few intrepid Israelis, our members were the only non-locals on the trails. The fewer trekkers on the trails made narrow bridge crossings quicker and easier, and finding times & places to pee along the trail without being seen by others was less challenging. With fewer customers in the teahouses and our group monopolizing campsites, our all-male group also enjoyed unrestrained farting & belching, which is always enhanced by altitude and unfamiliar foods. After settling in at the Katmandu Guest House and sharing tea with my friend Uttam, the hotel manager, we spent a couple days sightseeing in Ktm, led by Sangha, a guide supplied by our Nepali expedition co., Adventure Geo Treks. We viewed cremations at Pashupati on the banks of the Baghmati, ate lunch overlooking the giant stupa at Bouddhanath, and walked among the monkeys in the high temples of Swoyambho. Particularly interesting to me was an audience at Pashupati with the Milk Baba, a Hindu holy man who has consumed no food or drink other than milk for over 25 years. He is slim, healthy, an engaging conversationalist (thru an interpreter), and offered to prepare a meal for us and his disciples, although he wouldn't partake. 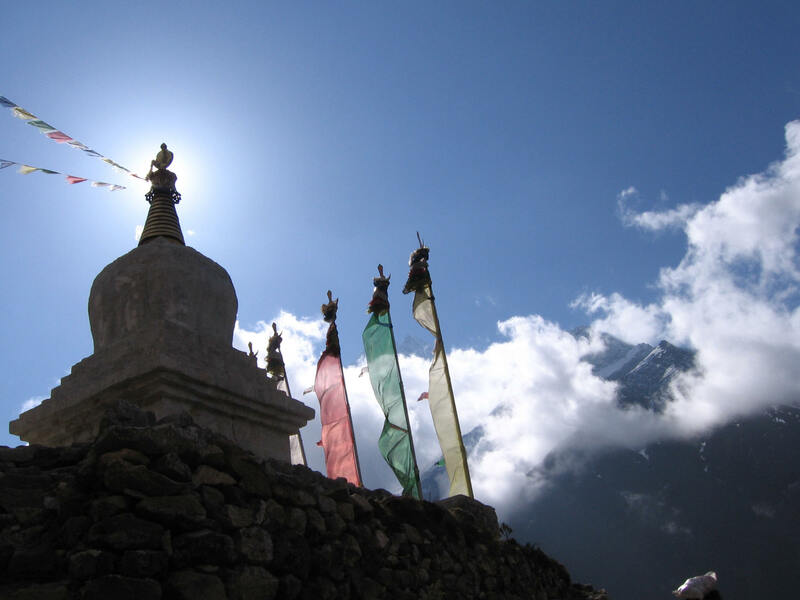 We flew up into the high Himalaya and landed on the airstrip in the Sherpa village of Lukla. While the views from the twin-prop plane are spectacular, the landing is always a big thrill as the runway begins above a sheer drop-off of hundreds of feet and ends at a cliff-face, so there is no room for pilot error. In Lukla we met up with our crew of porters, cook & kitchen staff, sirdar (head guide) and climbing guide, 17 in all, provided by Adventure Geo Treks, who would tend to all our needs over the next 15 days of hiking, camping & climbing. Nepali expedition companies run treks and mountaineering expeditions in the British tradition, which assumes that clients will engage in challenging hiking or climbing but expect to be well fed and pampered at the end of the day. While our porters carried 60 to 80 lbs of supplies up steep and hazardous trails, we carried only day packs with as much or as little as we chose. One of our members even had our sirdar, Ganesh, carry his day pack each day due to a flare up of low back pain. We spent the first two days trekking the Everest Base Camp trail through the lower Khumbu region, spending the nights at the Sherpa villages of Phak Ding and Namche Bazaar, the trading center of Sherpa and Tibetan commerce along the Base Camp trail. On our "rest day" in Namche Ganesh led us on a 4-hour day hike up to the Everest View Hotel for lunch, then through the village of Khumjung, where we viewed the famous/infamous Yeti skull and the first Hillary school for Sherpa children. [I gave pens, colored pencils and magic markers to all the children I met, partly as bribes for photo ops, as I hope to create a photo exhibit of the children's faces of Nepal with Bateman Photography.] That evening we visited the most famous resident of Namche, Gheylsan Sherpa, who served as one of the three high altitude porters on the first summit of Mt. Everest in 1953 by Tenzing Norgay and Edmund Hillary. I had met and interviewed Gheylsan in 2003 for an article I was writing, and had brought him a copy of the April 2003 edition of Outside Magazine, which had his picture on the cover, but which he had not seen. He had kept the worn and tattered copy of the magazine by his side these three years. 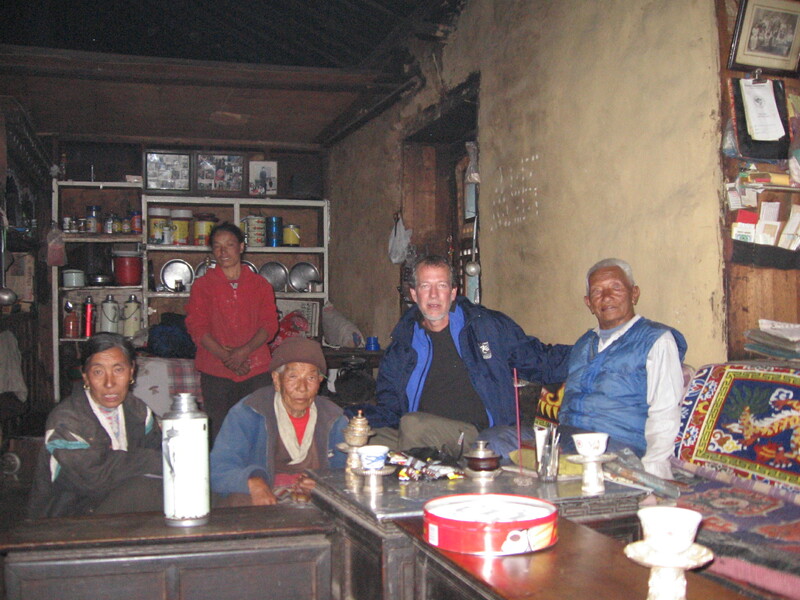 His family was delighted with our visit, and served us salted yak butter tea (which we politely choked down) and cookies. Gheylsan and his wife are quite old for Sherpas (late 80s in a country with average life-span of 49), and he has hearing problems. As we left, Mark & Vitto asked me whether we ought to offer them a gift of money, which I summarily dismissed as inappropriate. But then we conferred as a group outside the house, and Ganesh told us that it would be well received. Ganesh and I returned with a gift of 2,000 rupees (just under $30 US) from our group, and Gheylsan was so touched he leaped from his seat to present me with a kata (traditional silk scarf) in appreciation. The next day we branched off the main trail onto a trail new to me; the Gokyo trail. The altitude and wear on middle-aged bodies began taking their toll on our group, as Greg developed severe cold-like symptoms and migraines and I started suffering pressure headaches. Greg and I spent a recovery day in the stream-side village of Machermo, while the others trekked on to Gokyo. The following morning, Bill, Mark & Vitto hiked to the top of Gokyo Ri (5360 me; 17,581 ft), while Greg and I caught up with them for lunch in Gokyo. Beautiful blue lakes -- water on top of the world -- surround Gokyo. We camped in a yak pasture, called Dragnag, the following night. Vitto confessed over breakfast he'd acquired a severe case of yak-phobia -- he'd spent the night with a trekking pole in his hand convinced that a giant yak would break thru his tent and gore him. In the morning we scramble climbed up the Cho La, one of the highest and steepest passes in the region (5330 me; 17,482 ft). I was the weeny of Cho La as I'd developed a sinus infection, which sapped my strength, and I had a very difficult time reaching the pass. Our cook, Dorge, showed great patience and sensitivity by staying near me as I struggled to the top of the pass, but without humiliating me with offers of assistance. We were tested severely with two consecutive very long and difficult days of hiking and scramble climbing. Mark, a reserve colonel in the USMC, attested that the two days were the most physically challenging of his life and more difficult than Marine boot camp. When asked how hard it would be to climb Lobuche East (our planned climbing peak), Ganesh replied with a cheery laugh, that it would be at least 150% harder than Cho La. Mark and Vitto decided that their goal to experience the Himalayas had been met, and they preferred to pass on attempting the climb. In the morning they trekked out with our climbing guide, Norbu, and part of the crew to head back to Lukla. Bill had not intended to attempt the climb of Lobuche, so he took our English-speaking porter, Gopal, and headed up to Everest Base Camp, which was his ultimate goal of the trek having previously visited the Tibetan side of Chomolungma (Everest). Greg and I decided we would lower our sights from Lobuche East (6119 me; 20,070 ft) to the less difficult Pokalde Peak (5806 me; 19,044 ft), which I had climbed in 1998. To reach Pokalde base camp, the rest of the crew, Greg and I had to scramble up yet a higher pass, Kongma La (5535 me; 18,155 ft). Although Greg's cold symptoms returned, he and Ganesh went out on the snow fields and practiced with ice axe & crampons after we arrived in base camp. I spent about 18 hrs. huddled in my sleeping bag trying to rest & regain strength for the climb. In the morning Greg decided not to chance it, so Ganesh and I went up Pokalde at sunrise; the only ones on the mountain. It was partly cloudy, so our views of the Everest Massif and the other 8,000 meter peaks in the area were a bit disappointing, but the final fifty feet of free climbing rock at over 19,000 feet was one hell of an adrenaline rush. I collapsed into my tent totally exhausted after our descent, requesting only a wash bowl & puke pan. I wanted to lie in my tent the rest of the day, but, unfortunately, our climbing permit was for Lobuche, not Pokalde, and another team had crested Kongma La just after Ganesh and I descended, and Ganesh wanted us out of base camp before the other group set up its camp and came over to ours asking questions. [We could be fined and Ganesh's guiding license would be at risk for climbing without a permit.] So, after 1/2 hr rest we hurriedly broke camp and began the trek out to Dengboche. Ganesh and I fell behind the rest of our crew as I was laboring at such a slow pace. We got lost in dense fog and had to navigate by listening for the roar of the rushing Imja Khola river, fed by the glacier runoff from Everest. What should have been a 3.5 hr descent to Dengboche turned into 5 hrs of blindly picking our way down rocky mountainsides. While I got grumpier by the hour on exhausted legs, a sweet smile reposed on Ganesh's face and words of encouragement and jokes spilled from his lips -- so typical of the strength and sensitivity I have experienced in Nepalese guides. I rewarded myself with my 2d bucket shower of the trek in Dengboche. Reunited with Bill and Gopal, we trekked through a vast and blooming rhododendron forest to the Buddhist convent at Deboche and then to Tengboche Monastery. 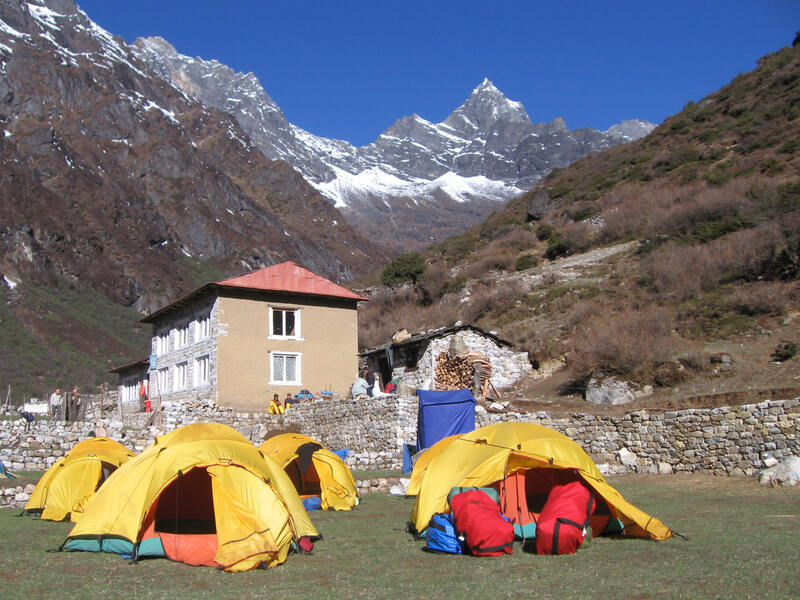 We camped on the monastery grounds from where one can see the majestic white peaks of the greatest mountains in the world, Everest, Lhotse, Lhotse Shar, Nuptse, Ama Dablam, Pumo Ri, etc. 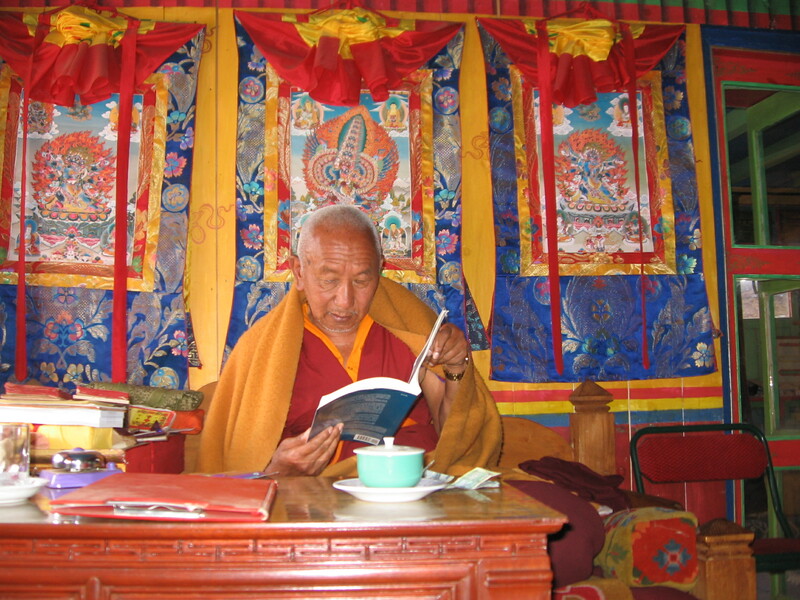 In the morning Ganesh and I obtained a private audience with the High Lama, Rimpoche Tenzing, who presides over Tengboche Monastery and is the most revered lama of the Sherpa people. I presented him with a copy of The Chrysalis Reader, a book of essays, including one written by me about the 50th Anniversary celebration of the first summit of Mt. Everest at Tengboche Monastery in 2003, which Lama Tenzing and Peter Hillary had hosted. Lama Tenzing seemed quite pleased to receive the book, and spent an hour in conversation with me (Ganesh interpreting). When asked what message I might take from him to friends in the US, he replied, "Tell everyone to cultivate love in their hearts. Tell the truth. And promote love in the heart and truth telling through religious discipline." We returned to Namche Bazaar and were lucky in our timing to be there for the Saturday market. But it was not as lively as I have seen it in the past, as there were so few tourists and the Tibetan traders, who hike all the way from Tibet to trade with the Sherpas, were few in number, we were told, because the Nepal government now refuses them entry as the Tibetans don't pay taxes. 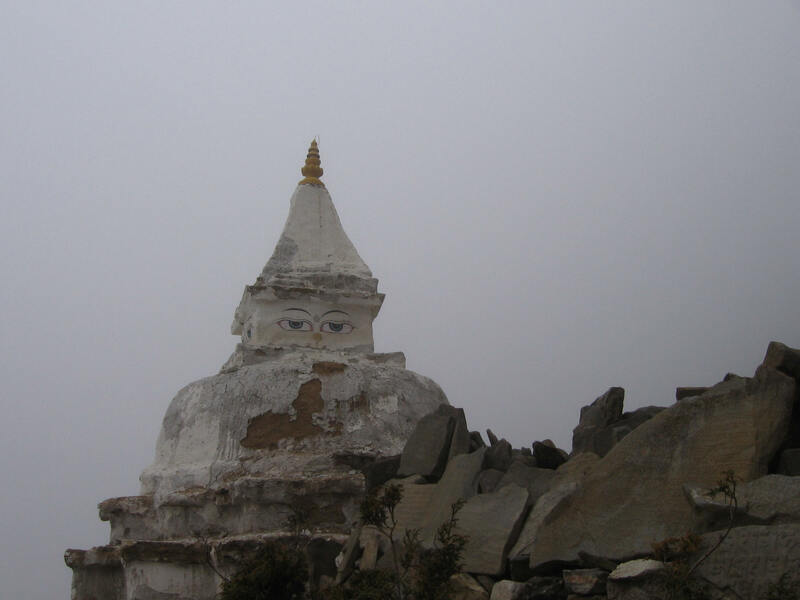 Our hike back to Lukla ended with the last hour in pouring rain, a good sign that it was time to go home. We had a final night in a lodge with hot showers and a final dinner with our crew; dancing & singing led by Norbu and his 100 verses of "Resper, resper, resperee, sometimes monkey, sometimes donkey ..."
Back in Ktm we reunited with Sangha for more sightseeing in Pataan and Bakhtapur, temple cities in the Katmandu Valley. Bill, Greg & I explored more of Ktm on foot and trawled Thamel, Durbar Square & Durbar Marg for presents to take home. Our last dinner was at Niru Rai's house with his family, Ganesh & Sangha. Niru is the owner of Adventure Geo Treks. The feast consisted of too many courses to count and many glasses of Mrs. Niru's home-brewed rakshi. My relationship with Niru began 9 months ago by email, when I discovered his company in my research of Nepali expedition companies. I determined that his co. would provide the best experience to our group. We were not disappointed, as the crew performed above our expectations. The food that came out of Dorge's makeshift kitchens each day was extraordinary. Ganesh's cheerful leadership and the crew's typically happy & considerate Nepali personality encouraged our own good humor every day. And we were treated with surprising extras like hot water bottles & liners for our sleeping bags each night and gifts of t-shirts & duffels at the end of the trek. Although, all the guys agreed that "the best experiences of the trek were the hardest days," the next time, I intend to include more rest days between hard days. And I do regret that none of the other guys were able to experience the technical climb of a Himalayan peak. After our dinner at Niru's, Bill and I walked the darkened streets of Thamel one last time and treated ourselves to a Guinness at Thamel's "authentic" Irish pub. We remarked on how much safer we felt at night on streets in Nepal than we would in American cities, noting that this is a culture in which busy vehicle traffic stops to allow animals safe passage and only the military & the Maoists have guns. Click here to read my published articles about these and other expeditions.